Scientific American / Farrar, Straus and Giro, 9780374537128, 224pp. Plants can hear—and taste things, too! 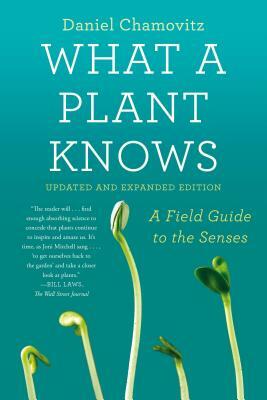 Thoroughly updated from root to leaf, this revised edition of the groundbreaking What a Plant Knows includes new revelations for lovers of all that is vegetal and verdant. The renowned biologist Daniel Chamovitz builds on the original edition to present an intriguing look at how plants themselves experience the world—from the colors they see to the schedules they keep, and now, what they do in fact hear and how they are able to taste. A rare inside look at what life is really like for the grass we walk on, the flowers we sniff, and the trees we climb, What a Plant Knows offers a greater understanding of their place in nature. Daniel Chamovitz, Ph.D., is the director of the Manna Center for Plant Biosciences at Tel Aviv University. He has served as a visiting scientist at Yale University and at the Fred Hutchinson Cancer Research Center, and has lectured at universities around the world. His research has appeared in leading scientific journals. Chamovitz lives with his wife and three children in Hod HaSharon, Israel. He is the author of What a Plant Knows: A Field Guide to the Senses.